Imprisoned for twenty-seven years for protesting against South Africa’s system of apartheid, Nelson Mandela was elected the nation’s first black president and became known as one of the greatest world leaders in recent memory. His work to end apartheid and unify the people of South Africa has influenced campaigns for human rights around the world. This biography profiles his long, remarkable life, beginning with his boyhood, education, and early involvement with the African National Congress. 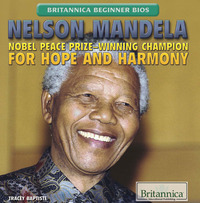 Young readers will be inspired by Mandela’s extraordinary courage, leadership, and capacity for forgiveness.